In Brief: Take an easy stroll about a somewhat spooky abandoned village, and finish the day with a tour of Tanzhe Temple and its nearby Pagoda Forest. 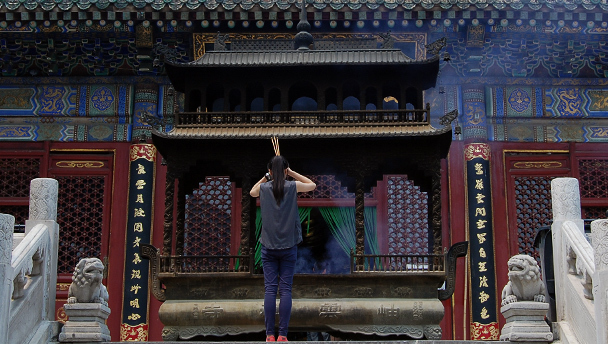 A visitor to Tanzhe Temple raises burning incense in prayer. On this trip, you’ll get some good—but not tough—exercise, and will have plenty of time to look around Tanzhe Temple. You’ll also get a great meal of Chinese food at one of the restaurants just outside the temple. 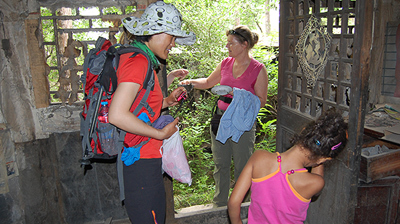 Price of the hike includes the 55 RMB entrance fee at Tanzhe Temple. Investigating one of the old houses in the abandoned village. Click to view a larger version. Near the end of a dead-end road in the hills close by to Tanzhe Temple is a little path that leads up and into a mostly-abandoned village. Near the top of the village there are some newer buildings that are still inhabited, but the rest of the old stone courtyard buildings are all empty – some empty for a long time, and some that show signs of more recent habitation. Our local guide grew up in the area, and is always happy to show us around his old stomping ground. We’ll follow the stone steps up into the village and make our way through the old alleys and lanes, stopping off at a few of the larger courtyard houses for a closer look. The houses in the village are a mixture of stone and brick construction, and some look really, really old. Some of the houses are also a little bit spooky, with lots of little rooms and old furniture, books, clothes, and papers. Out the back of the village is a nice concreted path that leads into the hills behind the village. It’s mostly flat, and follows the ridgeline around to a set of stone steps that lead down to a reservoir, where the bus will meet us and we’ll drive on to Tanzhe Temple. Tanzhe Temple covers an area of six hectares, and is said to be the oldest temple in the Beijing area, even older than Beijing city. Many of the buildings that can be seen in the temple were built during the Ming (1368–1644) and Qing (1644–1911) Dynasties, but pagodas and other structures from the earlier Jin and Yuan (1271–1368) Dynasties still remain, including two ‘Emperor Trees’ that were planted roughly 1,000 years ago. We’ll take a walk up the central axis of the temple, and then explore the pavilions and halls to either side on the way back down. The Floating Cup Pavilion, where the Emperor Qianlong and his courtiers used to play an interesting drinking game. The Big Bronze Boiler, left over from the old kitchens of the temple. It’s said that one boiler-worth of porridge could feed all the temple’s monks for a whole day. The Diamond Life-Extension Tower, a white stupa by a pool at the northern end of the temple complex. The Pagoda Forest, where pagodas mark where the ashes of important monks are interred. We’ll visit on the way to the temple’s main gate. This is not really a hike – it’s more of a walk. 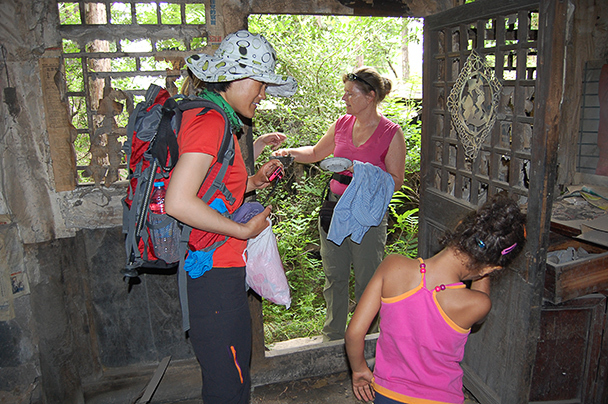 Photos from our look about an abandoned village and Tanzhe Temple.